The evocative name of this building at the Sochi Olympics is one of the more unique. Icebergs command attention; they are powerful and beautiful to behold. They also suggest passing grandeur, so I hope the public still has access to it post-Games, unlike Beijing’s Bird’s Nest, which sits empty, even abandoned. “Iceberg” means well. A tip of the berg for being short, fun to say and easy to remember, but it’s suggestively off. 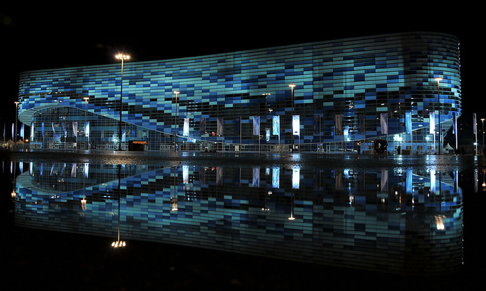 You see, this structure is shades of blue, and more so when lit up at night. Glaciers are blue due to the lack of air in their creeping shelves. In contrast, icebergs — full of tiny air bubbles — are mostly white, as the bubbles’ surfaces reflect light. The blue-ish streaks in an iceberg represent crevasse-filling meltwater that’s refrozen. Air-tight vs. air-light. Similarly, roughly 90% of an iceberg is under water, yet the home of the latest skategate appears largely above-surface. The venue would be better verbally-grounded if more of it had been recessed into the earth. Which brings me to…if this is an iceberg, what type is it? The terminology of some of the sizes and shapes of these frozen masses are cool. I have seen smaller ones — growlers and bergy bits — in Chile. Shape-wise, the Skating Palace looks like a hybrid: “tabular” for its crew-cut and horizontal banding and “blocky” for the steep sides. Here’s where the Russians missed. U-shaped bergs, with the bottom of the “U” reaching almost to or at water level and cradled or book-ended by sky-reaching spires, are referred to as “dry-docked.” Considering the lack of natural precipitation at seaside Sochi, officials there could have thrown down some serious naming with “The Drydock” for the half-pipe. At least they didn’t resort to calling the palace the “Sea-Hill.” Such was the synonym for calved glaciers in the late 17th century. I’m not sure how long that term floated around, but the partially Anglicized Dutch loanword for “ice mountain” obviously got more points for style back then and thus is still in play.